Leilani Munter (No. 55 What The Health Toyota) led the way on the first day of testing for the ARCA Racing Series presented by Menards at Daytona International Speedway on Friday afternoon. 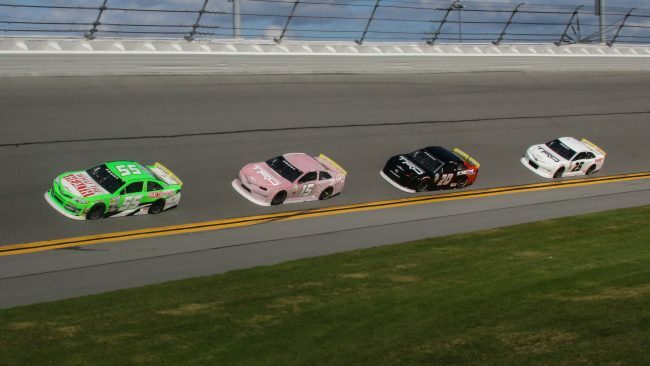 Munter turned a fast lap at 184.064 miles per hour while leading a pack of cars around the 2.5-mile tri-oval as she prepares to make her seventh ARCA Racing Series start at Daytona. Munter’s teammate Christian Eckes (No. 15 Venturini Motorsports Toyota) was second fastest in the draft at 184.023 miles per hour. The two other Venturini teammates, Harrison Burton (No. 20 JP Racing Toyota) and Michael Self (No. 25 Sinclair Lubricants Toyota) were third and fourth respectively. Todd Gilliland (No. 4 DGR-Crosley Racing Toyota) rounded out the top five. Riley Herbst (No. 18H Monster Energy/ORCA Coolers Toyota) was sixth, Derrick Lancaster (No. 29 On Point Motorsports Toyota) was seventh, Bret Holmes (No. 23 Bret Holmes Racing Chevrolet) was eighth, Gus Dean (No. 32 Win-Tron Racing Toyota) was ninth, and Parker Kligerman (No. 22K Chad Bryant Racing Ford) rounded out the top ten. Most of the teams worked on single car runs throughout the morning and afternoon sessions, but the Venturini team dedicated considerable time to working in the draft. The Empire Racing teammates, Sean Corr (No. 43 Chevrolet) and Thad Moffitt (No. 46 Performance Plus Oil Chevrolet) also spent time drafting with each other in the morning session. Codie Rohrbaugh (No. 7 Grant County Mulch Chevrolet) led the morning session with a single-car speed of 178.119 miles per hour. Gilliland was second, with Ty Gibbs (No. 18G Monster Energy/ORCA Coolers Toyota) third at 177.786 miles per hour. Teammate Riley Herbst was fourth and Burton was fifth. There only incidents of the day involved Lanacaster (oil leak) and Dave Mader III (No. 63 Chevrolet), who scuffed the outside wall and scraped the decals off the side of his car. Testing for the Lucas Oil 200 driven by General Tire will continue tomorrow with the morning session running from 9 am through noon ET, and the afternoon session from 1 pm through 5 pm ET. ARCA for Me members can access live timing & scoring, live chat, and live track updates throughout the day. New members can join at arcaracing.com/login.